“What if we don’t build a fort this year,” Kirby mused aloud. He began to pace again. “O…K…?” Marvin said slowly, clearly confused. Marvin shrugged and shook his head. He didn’t look convinced. Checking the alarm clock on the nightstand by Kirby’s bed he said: “Better get home.” Marvin stooped down to pick up his blue hoodie from the floor. 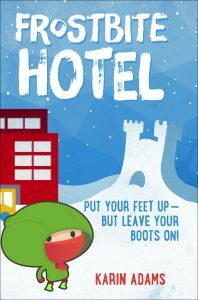 You can ask for “Frostbite Hotel” by Karin Adams at your favourite local bookstore. It is published by James Lorimer & Company Ltd. ISBN(hardback): 9781459407077 ISBN(paperback): 9781459407060 or ISBN(e-book): 9781459407084. Frostbite Hotel is carried by most major booksellers around the world! To find an online seller in your country, or just want to see more shopping options, you can do a web search for “Frostbite Hotel” by Karin Adams.